Once upon a time . . . .” The inspiration for this mysterious beauty in the wood comes from the classic fairy tale The Frog Prince wherein the most beautiful princess in the land loses her little gold ball down a well and promises a frog he can be her dearest companion if only he retrieves the it. To make this short story shorter, he does and she reneges on her promise until her father, the king, seizing the opportunity of a teaching moment, makes her keep her promise. The lovely princess holds her nose to befriend the frog but after a few days, she actually does like her new friend and kisses him. He turns into the prince he was before a witch cast a spell on him and the two live happily ever after. 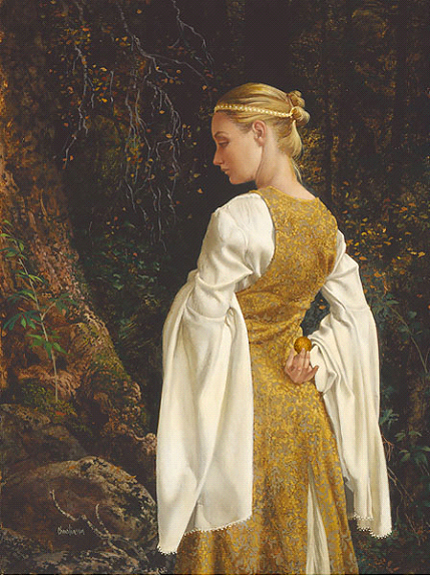 Foremost fantasy artist James C. Christensen captures the precise moment of truth where the delicate fingertips of the princess holds her most precious object and contemplates the cost of keeping it, against the cost of sharing her love with the world. Luckily for that frog, she made the right choice.